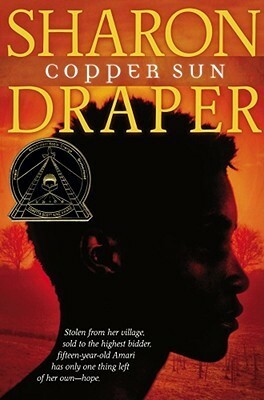 Draper, S. (2006). Copper sun. New York: Antheneum. Personal reaction to the book: A fictionalized, highly didactic lecture on the evils of slavery. Has zero ring of honesty. – There’s a longish speech on how slaves in America can be well-treated but still not truly happy because they’re slaves. OK, I’m in agreement with that. But earlier, there’s a passage about how the slaves the Ashanti took weren’t really slaves because they were well-treated. Make. Up. Your. Mind. – Also, is there anyplace in Africa that has abundant native pineapples, coconuts, plantains, yams, giraffes, is in heavy jungle and nowhere near the ocean? Hmmm … nope, didn’t think so. There’s a lengthy list of reference works Draper consulted in virtually every area of this book … except Africa, which is magical happy land where everything is good and everyone is kind; so like Lake Wobegon only warmer. None of this is to say slavery is good, or even OK, but this is a novel about a very bad thing with cardboard characters and a plot with about as many branches as a palm tree. For students with no background in this part of history, it undoubtedly has real value, but it is simplistic as a story, even compared to many books aimed at a teenage audience. Author facts: A former National Teacher of the Year and five-time winner of the Coretta Scott King Literary Awards, Draper’s website includes “homework help” and Common Core tie-ins for schools using her books. She got her start as an author when, with a student’s prodding, she won a $5,000 writing contest with a short story. She lives in Cincinnati, Ohio, with her husband.